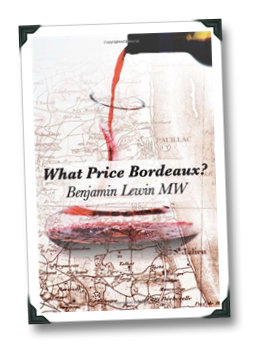 Master of Wine and scientist Benjamin Lewin’s non-fiction book What Price Bordeaux has a title that, unlike many non-fictional works, is meant to convey a series of meanings or themes that are touched on at some point in the body of the work itself. The skyrocketing prices of wines from Bordeaux’s top chateau, while its minor AOCs are in such crisis that they are forced to sell their wines for distillation in order to avoid bankruptcy. 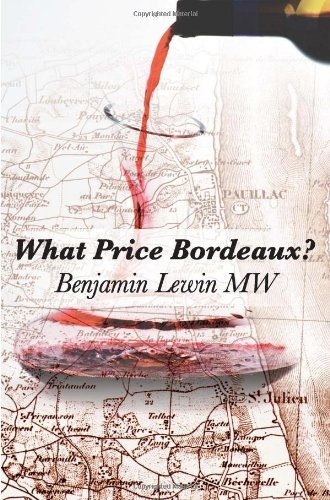 The maddening opacity of Bordeaux’s wine business, which Lewin investigated intensely in the writing of his book, and where simple data points, such as the average price of a bottle of red Bordeaux in 2007, were hidden from him by the area’s professional organizations. The 1855 Classification of Bordeaux’s top producers, which organized the “best” wines by price in the Medoc (Lewin boldly offers an updated, new classification in What Price Bordeaux, which contains some shockers in terms of who now ranks above whom in current Bordeaux market prices). 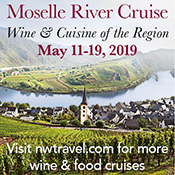 The loss of Bordeaux wines’ identities in favor of an “International” red wine style currently more popular with consumers and influential wine critics – resulting in skyrocketing price increases and occasional price crashes for high-end Bordeaux wines. What Price Bordeaux contains enough fodder for a month’s worth of wine blog posts, but that would deny you the pleasures (and shock) of reading it (which I recommend that you do). Instead, it’s the last point above that I want to talk about, concentrating on Chapter 10 (“The New Bordeaux”), which alone is worth the price of the book. Let’s do this by the numbers, since that’s really how Lewin makes his strongest arguments for the changes in Bordeaux in the last few decades. First, the plantings in Bordeaux certainly support the idea that there has been a growing (ha-ha!) trend to create wines that are more accessible and more easily drinkable earlier. Between 1985 and 2007, in the classified growths, Cabernet Sauvignon plantings have decreased about 5%, Cabernet Franc decreased about the same amount (and overall represents only about 5% of the overall total), Petit Verdot remains a very minor player, and Malbec and Carmenere barely register when graphing the plantings. During the same time frame, plantings of the lush and easy-drinking Merlot increased nearly 10% – suggesting a move towards more Merlot to soften the wines and make them more accessible earlier. Between 1970 and 2005, potential alcohol levels in Bordeaux grapes have increased 15-20%, while acidity has decreased about 10% per decade and is now at roughly 75% of the 1970s levels. This is in-line with the International style of high-end reds (less acid, more booze, more up-front fruit). So far, this still looks like the classified Bordelais growths are chasing the bombastic, high-point-scoring (and therefore high-price-demanding) style. BUT… take a look at the climate numbers before you totally condemn the Bordelais for giving up their terroir-inspired legacy in favor of the almighty dollar. Over the past 50 years, the average temperature in Bordeaux has climbed by nearly 3 degrees Centigrade, closer to the average temperature of the Southern Rhone in the 1950s. This means that grapes ripen differently than in the past and have to be harvested earlier – about 13 days earlier on average. During the same time, the average growing season temperature has risen in Bordeaux, and is now roughly equal to that of the Napa Valley. Rainfall in the same timespan has fallen 3mm per decade. Maybe Bordeaux isn’t just chasing the big points after all – maybe Bordeaux is trending towards an “International Style”of higher alcohol and greater fruit extraction not just out of economic incentive, but also because climate change is making that style inevitable. As a wine lover (and Bordeaux fan), as well as an advocate of artistic license, it pains me to say that you've got to do what it takes to be marketable. There are some boutique wineries out there who seem to not care about selling the wine (perhaps made-men in a previous life following their passions), but most of the small chateaux are just doing their lives' work and trying to make a dollar. If a change in style is necessary (sad as it may seem), adaptability is the name of the game in business. The small guys don't have the names out in the market, so they'll have to try harder. Also, I thought France was allowing varietal labeling on AOC wine now (through the now-named "AOP"). Am I smoking something? I think you're right, the variety labeling is approved but I'm not sure what the effort / timeline will be in seeing that in the market. I do agree that change is part of the game, and certainly going back through history the definition of what consumers would have considered fine Bord'x has changed dramatically. Having said that, the pace of change seems to be accelerating, and it seems that the jury is still deliberating in terms of whether or not Bord'x is keeping pace with state of change or is artificially accelerating it in pursuit of the almighty Euro. I think there's some other factors at work here as well. They are probably mentioned in the book (which I'll order through your link so you get your affiliate money), but one I'll throw out there is that in the recent past, the under $15 Bordeaux that makes it to these shores hasn't been very good. In fact, a lot of it is terrible. First to clean things up was Australia, followed more recently by Argentina, Chile, Spain, and most recently, Italy. Heck, even Cote du Rhone has figured out how to make a very drinkable wine for under $15. It seems the Bordelais is either too stubborn, stupid, or both. Those that have made the change are making money. What a shock. Also, I don't think the terrior-driven wines of Bordeaux are going away anytime soon. There style might change slightly due to climate, but those wines still command the prices they get because someone out there likes it, and evidently, they like it enough that the Bordelais can charge $200+ for these bottles. But if Bordeaux wants to survive, and not have to turn everything into vinegar or rubbing alcohol, they are going to have to figure out how to make a good wine FOR EXPORT that's $15 or under. Benjamin Lewin's book looks like it will end up on my ever growing list of wine books. Thanks for bringing it to my attention. I have a quick thought. If, as you state, the Bordelais are harvesting 2 weeks (13 days, you say) earlier than 50 years ago, then why not plant more Cab S. which typically ripens 2 weeks after Merlot? It seems to me, if mother nature is offering a natural boost to the Medoc's dominant grape, it would seem strange to plant more Merlot there. This action would actually support an international style and point chasing argument. The climate data, is that an aggregate of Bordeaux left and right bank? Or is that just left bank? I was a bit confused, regarding the scope of your post. I couldn't tell for sure if the whole post dealt exclusively with the Medoc and classified wines or Bordeaux as a whole. To Richard Sholtz, regarding what I consider homogenization and a matter of taste. I find more "drinkable" $15 and under Bordeaux than I do New World Bordeaux blends, but that's my palate. It smacks a bit of "Mob Rule" (in the pejorative) to suggest that any region ought to get it's act together to please the masses. If you are only in it for the money, however, I agree that's the way to do it. Another thought provoking post Joe. Cheers! Hey Richard – the temp. change I believe is both Left & Right Bank, but the planting data I think it only for the classified Medoc brands. Don't have the book handy but will double-check it later and update here if I've got that incorrect. I think the Merlot planting argument from Lewin is really around the Medoc classified growths adding more and more Merlot to the blends, though that may have transpired before the impacts of the rise in average Bord'x temp. (could also be that the temp. data, being average, isn't reflecting the true temp. of the Medoc which might not have been as warm on average, etc.). Wouldn't the warmer climate allow for more cabernet sauvignon, which does not ripen in cooler climates? If I understand that correctly, the warmer temperatures would not explain increased merlot plantings. Another interesting question is how the big drop in acids will change how wines age. Will the wines from **The Vintage Of The Century** (2000, 2005, 2009, and many more to come, no doubt) age the same way as the wines of 1945 or 1961? Interestingly, Lewin does discuss the lower acid question – he cites the `82 Bord'x vintage, which had riper, more extracted wines with lower acidity, and that in his experience they're aging well. Great post here, Joe! Parts of Bordeaux definitely have embraced the concept of New World winemaking. Leoville Las Cases is one of the few to actually admit to using reverse osmosis in their production, and many more are doing it without making it public. While stylistically many have tried to remain true to Bordeaux, using classic techniques etc, you can't do anything about a 3 degree temperature swing. Great research here, thanks for the insight! Thanks, Jon! I wish I had been tenacious enough to do that research :-). The book is more than worth the price of admission as they say. Cheers!